1. 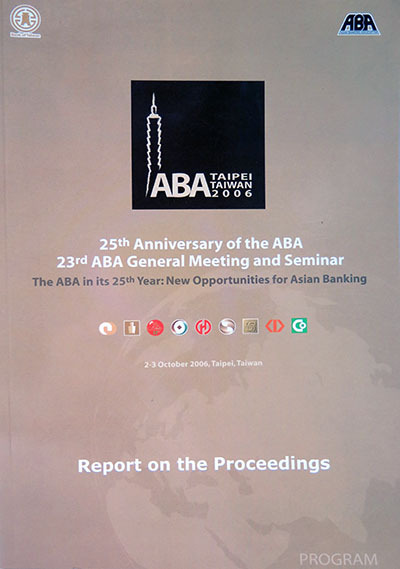 The 23rd ABA General Meeting and Seminar was held on 2-3 October 2006 at the Grand Hotel in Taipei, Taiwan. Over 220 high-ranking bank executives, banking experts, government officials, and bank regulators from 20 countries attended the two-day meeting. 2. Hosted by The Bank of Taiwan, this year’s gathering, which also marked the 25th Anniversary of the Association, focused on the theme ”The ABA in its 25th Year: New Opportunities for Asian Banking.” Eminent speakers shared their views on the new challenges and opportunities faced by Asian bankers amidst the continued advance of globalization and the intensifying competition for markets. 3. The 37th and 3gth Board of Directors’ Meetings were also held in conjunction with this year’s annual meeting. The ABA Board discussed internal policy matters, reviewed the status of the various ongoing ABA projects and programs, elected new officers and members of the Board who would serve for the term 2006-2008 and approved the framework for the ABA Work Program for the next two years. underscored the need for a stable and efficient financial system in order for any country to achieve economic growth. 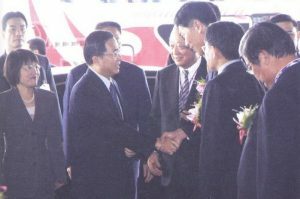 He outlined the various measures contained in the financial package for the first-phase three-year (2007-2009) stimulation plan which is aimed at building a diversified, internationalized, stable and reliable financial market and develop the financial services sector, and called on bankers from all over Asia to play a part in carrying out these plans. The full text of President Chen’s Inaugural Address is attached as Annex 1. Session One focused on ”Macroeconomic Challenges.” Invited speakers analyzed the implications for the region’s banking industry of the current global and regional macroeconomic situation, examined the effectiveness of current monetary policy in maintaining overall economic stability, and assessed the prospects for the region’s continued economic growth. Session Two focused on ”Opportunities in the Emerging Asian Financial Markets.” Invited speakers shared their views on the development of key emerging Asia markets and the new opportunities arising in these economies for financial institutions. Session Three dwelt on “Financial Reforms and Restructuring”. Discussion focused on the ongoing process of financial reform and restructuring in the region and their implications for the future of Asian banking. Session Four took a closer look at the factors driving regional financial integration, its progress and prospects, what it means for the future of the region’s banking industry, and the opportunities and challenges that it brings for banks operating in Asian markets. 5. Mr. Richard Koo, Chief Economist at Nomura Research Institute, delivered the Luncheon Speech. Mr. Koo shared his valuable insights on the challenges facing the Japanese and Asian economies. The Board approved two position papers. One position paper focused on the implementation of Basel II in the Asia-Pacific region. The ABA called on governments to balance the need to speed up the adoption of Basel II with the need to have the preconditions in place for its effective implementation. These precondition, according to the ABA, are the appropriate infrastructure, a system of effective supervision, and sound accounting and provisioning standards. In the other position paper, the ABA called on APEC to convene policy dialogues between officials of individual APEC member countries and finance industry representatives to chart concrete measures to develop each country’s bond market. 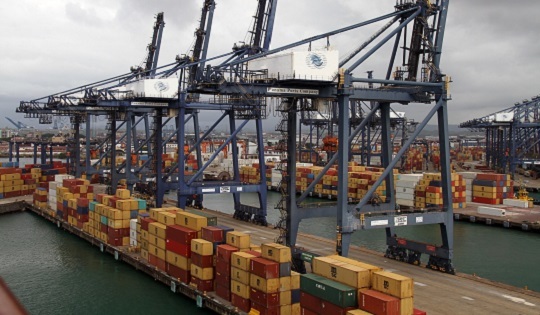 In addition, the ABA also asked APEC to endorse the wider adoption of the regional informal workout guidelines and model agreement jointly developed by ABA and the Asian Development Bank. Approved the Chairman’s Report, which summarized the activities undertaken by the ABA over the past year in the area of policy advocacy, training programs for members, membership drive, relationship with other regional bankers groups, and participation in other regional events. 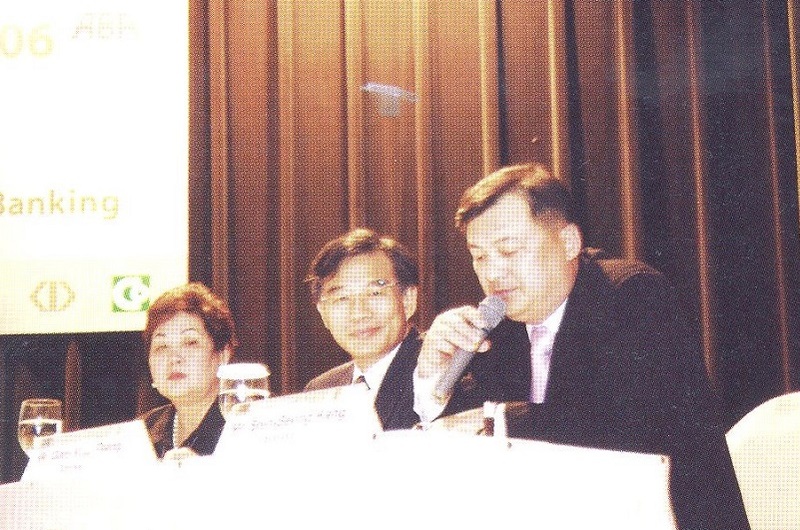 Elected Mr. McKinney Tsai, Chairman of Mega International Commercial Bank from Taiwan, as the new ABA Chairrnan, replacing Mr. Dong-Soo Choi from Shinhan Bank of Korea. Dr. Vu Viet Ngoan, Chief Executive Officer of the Bank for Foreign Trade of Vietnam, was named the new ABA Vice Chairman, taking over from Mr. Joseph J. C. Lyu, former Chairman of The Bank of Taiwan. Adopted its 2006-2008 Work Program outlining activities over the next two years in the area of policy advocacy, information exchange, capacity building, strengthening relationship with other regional and international organizations, and membership expansion. 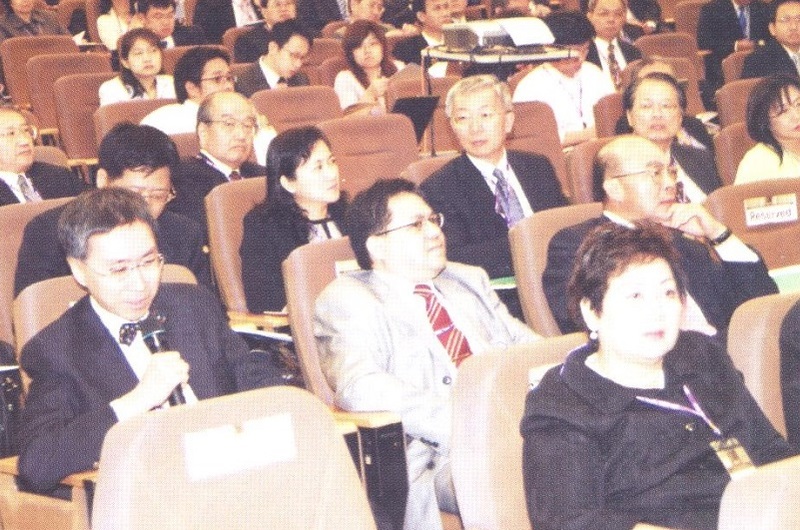 Agreed to hold its 24th General Meeting and Seminar in Hong Kong in 2007 to be hosted by the Bank of East Asia, Ltd. The exact date and venue will be announced later after further consultation with the host bank. Passed a resolution to present a distinguished service plaque to outgoing Chairman Mr. Choi for his outstanding service to the Association during his incumbency. Passed a resolution of thanks for the Bank of Taiwan for the excellent arrangements made for the meeting and for its warm hospitality to the delegates. 10. Outgoing Chairman Mr. Dong-Sao Choi and Chairman Emeritus Dr. Jeffrey L. S. Koo headed the panel that responded to the questions fielded by the media people during the Press Conference held on the afternoon of October 3. A copy of the Press Release issued by the ABA and distributed to the press people at the Press Conference is attached as Annex 2. 11. The ABA took the occasion to sign a Memorandum of Understanding (MOU) with the Mongolian Bankers Association (MBA) identifying possible areas of cooperation between the two organizations. The MOU was signed by ABA Outgoing Chairman Mr. Dong-Soo Choi and MBA President Mr. Saintsogt Chimid. 12. Mr. McKinney Tsai and Dr. Vu Viet Ngoan in an official turnover ceremony were installed as the new ABA Chairman and the new ABA Vice Chairman, respectively, for the term 2006-2008. 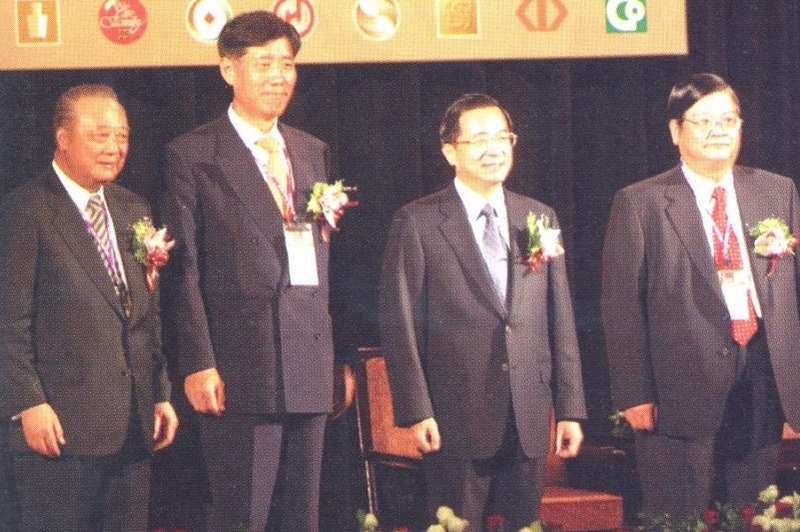 Chairman Emeritus Dr. Jeffrey L. S. Koo administered the oath-taking for both Mr. Tsai and Dr. Ngoan. 13. Premier Su Tseng Chang of the Republic of China was the Special Guest of Honor at the Farewell Dinner. In his remarks to the delegates, Premier Su outlined some of the financial reforms undertaken by Taiwan over the past few years as part of the effort to boost the island ‘s national competitiveness. He stressed that the Taiwanese government is dedicated to fostering an investment environment that is conducive to the growth and development of the financial industry. The full text of Premier Su’s remarks is attached as Annex 3.